What if someone was born on 29 February ? So, you all get together at just the right time, then yell, 'Ha---'. Because it's the thought that matters. Then of course go ahead and eat the belated birthday cake. Ponies, ducks, baby kittens, and nice smiles. The instant between Feb 28th and March 1st is all the time they get in a year when there's no Feb 29th. They don't get a full day to celebrate, just a fraction of a millisecond. I'd wish it were more tempting to love and forgive, rather than hate and judge on another. I finally finished my first fanfic (the first part of three, anyway). I can't directly link it because of forum rules with mature content, but it's on on my FiMFic if anyone wants to read it. It's a pretty gory BattleTech crossover, though the first few chapters are a bit lighthearted. It's 85k words, so don't go expecting to read it in half an hour. Nice I’ll take a look at it what’s your fimfiction? It's also on my user page here under contact methods and in my post signature. You'll need to turn off the mature filter to see it. Oh I'm sure! And talk about other ponies forgetting it because it only happens twice per decade! I hope the Dragonshy dragon will have a big role again. This right here, is the definition of cute. My dreams typically tend to focus on the real world but at the same time are weird as buck, and I very rarely have nightmares. 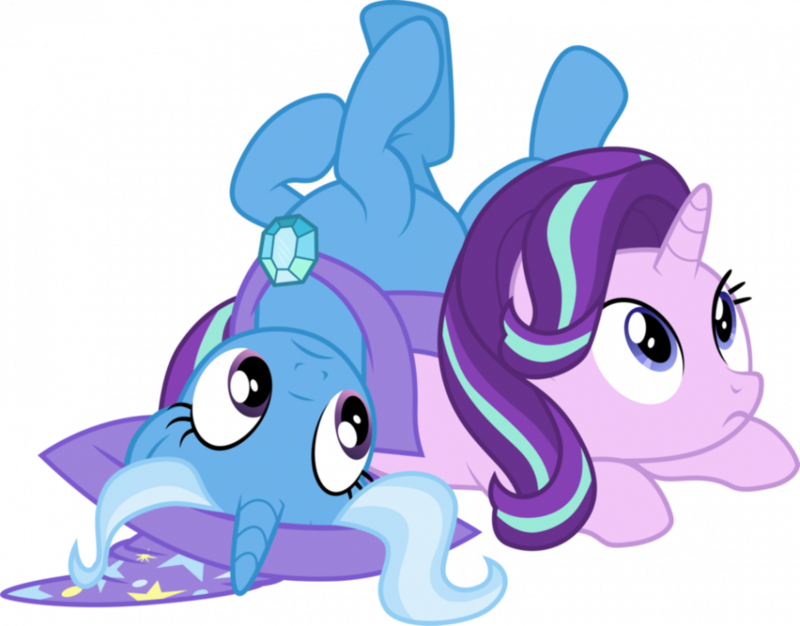 Aren't Starlight and Trixie the cutest pair of friends. I'm still holding out for more antics like when they lost the map table. I'd wish for an unlimited lifetime supply of Publix fried chicken. Hey, can I discuss an event idea with you? I also think that Season 6 is mostly pretty good. Not great mind you, but still good. But I can gather some reasons as to why some people aren't as fond of it: 1. It was seen as a step down coming off the heels of an amazing Season 5. 2. Starlight Glimmer's presence bothered her detractors, while people who were fans of the character felt that Season 6 underutilized her. 3. It featured some of the more unpopular episodes in recent memory (Newbie Dash, The Cart Before The Ponies, 28 Pranks Later). 4. It's sandwiched between two of the show's strongest seasons in S5 and S7. That's just a few reasons I can think of I don't agree with many of the reasons, btw. Time for me to do my usual thing around here. So many unicorns... plus one alicorn. Obligatory Sunset swimsuit image... but a little extreme. Now that's what I call good advertising. The Sunset has been doubled. What would you ask a truth genie? My question would be: What do I need to do to successfully become an omnipotent, omniscient, omnipresent goddess with what I realistically have at my disposal? Sporange. Rare alternative version of sporangium. There’s being adorable and then there’s being Sweetie Belle!